Immense display by Swinford in the second half, showing that there is plenty of football and self belief in the team, but all came up short when Parke scored the winning point 2 minutes into injury time. At half time the game looked like it was game over with no way back for Swinford as Parke KC led 1-10 to 0-3. Swinford scores coming from two for Liam Moran and one for Tom Horkan. Within a minute of the restart Swinford had a penalty. It was well saved by the Parke goalkeeper but thankfully came back to Liam Moran who made no mistake with the rebound. Parke came back with a point but points from Tom Horkan and Liam Moran gave Swinford a lifeline. A great save by Damien Geraghty and some poor finishing by Parke gave us a boost and substitute Darren Campbell got our second goal, followed up by a Johnny Burke point to put only 2 between the teams after ten minutes of the second half. Tom Horkan brought the game back to the bare minimum before Parke scored their second of the half. Both teams had a couple of wides before two frees were put over by Liam Moran to level the game with three minutes left on the clock. There was to be a few minutes of inury time due to an injury to Kevin McDonagh. At this stage a point was deserved by Swinford for the second half performance but on the 62nd minute Parke KC got what this writer can only say was a very soft free to go ahead. We had a half chance to level the game but time was to run out and the game ended Parke KC 1-13 Swinford 2-9. With wins for Achill, Ardagh and Castlebar Mitchels things are now very tight at the bottom of Division 1C but if Swinford can play for 60+ minutes like the second half today the tide will turn. 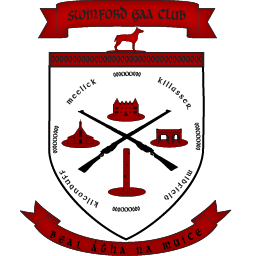 Swinford: Damien Geraghty, Alan McLoughlin, Sean Brady, Kevin Barry, Joshua Smith, Ryan Convey, James Lavin, Johnny Burke, Michael Walsh, Tom Horkan, James Sweeney, Liam Moran, Kevin McDonagh, Dermot McNicholas, Michael Prendergast. Subs Darren Campbell, Conor Conway, Louis Cummins. Scorers: Liam Moran 1-5, Darren Campbell 1-0, Tom Horkan 0-3, Johnny Burke 0-1.